My mom’s a big fan of ELO. My dad’s a big fan of ELO. I’m a big fan of ELO, thanks to them and a film I’ll be talking about sometime soon. 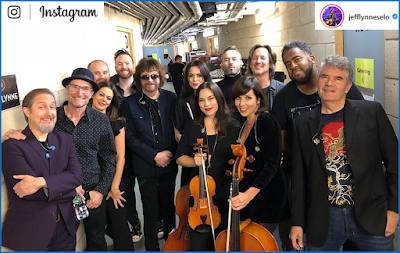 So when it came to Jeff Lynne starting touring again, I knew that soon would be the time. Soon I would be going to watch. And Friday 12th October was that day. The tickets had been bought by my dad when the tour had first been announced this year, and I was looking forward to it. Then comes a few days before the date we’d be going where the excitement builds, then the day itself. During the journey I was reading Star Wars Rogue Planet, and then we arrived and ate at Ed’s Easy Diner. The start of the event had Billy Lockett open up with a set of songs that lasted around forty minutes. The pop-rock artist from Northampton played and sang well, with some good songs including Empty House and Fading Into Grey. There felt a charged emotion within them, songs that felt personal. And Billy himself exuded personality in talking with the amassed crowd. With his set complete, there followed a break of around half an hour. Then it was time for the main event itself. An explosion of sound and lights started up as the first song began. I’m betting it was still storming it down outside, so Standin’ in the Rain gave me a smile. The band played through the setlist of 19 with a lot of passion, with the music sounding – as Lynne himself has always said – at it’s best when heard live. Following the first song were Evil Woman and All Over The World. Two of the best in my eyes – not counting those from the finale. During the pauses between songs, the crowd would be going wild with whistles and shouts of admiration. At one point in time, there was also a chorus of “Oggy! Oggy! Oggy! Oi! Oi! Oi!”. There was a lot of energy in the crowd, that’s for sure. Featured from the new album was When I Was A Boy, which has a great sound to it, and proves that Jeff Lynne can still produce some good hits. A favourite of the crowd was Handle With Care – a song from another of his bands The Travelling Wilburys and the song that pays tribute to Roy Orbison and the others of that band. Rockaria! had a good sound to it, with the high opera tone of one of backing singers really bringing the right tone to the song. Shine a Little Love had a great looking green-hued laser-light show playing. By this point the crowd were starting to get up and groove, and while I wasn’t up for standing, I was also in the groove. The atmosphere had reached its party point, and so the finale was upon us. After Turn to Stone played, it was the turn of Mr. Blue Sky – the song that many say is the one that encompasses all of what ELO is about. It was my first introduction to the band, so I’m with them on that. And it was magical to listen to live. With an encore of Roll Over Beethoven to finish the night off, I couldn’t have asked for better. It was a great night, and one I would want to repeat – even if it was the exact song order from this event. Listening to any band live is an experience to cherish. Something I found out with Crush 40 during Summer of Sonic ’16. And that’s something I wouldn’t mind revisiting either. As for the Electric Light Orchestra and the show they put on, I’ve already said it was magical. It was also amazing to finally have the beats of their rock thumping in my heart.